Emma, the youngest sister, has experience in marketing and reaching the customers, and is always on top of trends. So the Sisters decided to work together to create high quality & fashionable apparel, and source well-made, one-of-a-kind accessories and home products around the globe. They started their journey on by selling on eBay at first in 2010, after one year of hard work, they've gained a large customer base. 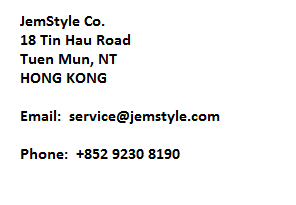 Everyone is amazed with the quality and the price they were getting from JemStyle. To create a better shopping experience for their customers, the Sisters launched JemStyle.com to continue offer best quality products with very good price! Their story has just begun, here at JemStyle.com, you will find every piece of merchandise we offer were handpicked and inspected to ensure the best quality, our close relationships with suppliers and manufacturers have enbaled us to offer amazing prices that you won't believe.